As the light fades on traditional television sets, online screens shine brighter. This begs the question: Will live sports content be consumed online in the same way it has been through traditional TV? 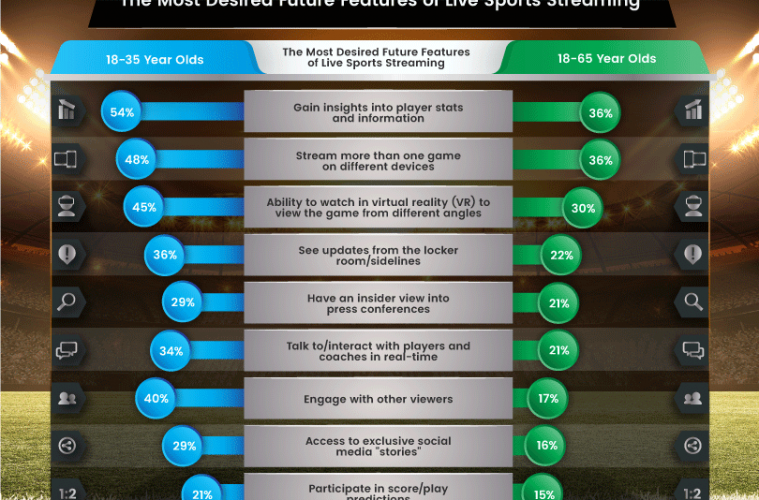 Golfsupport.com analysed PwC’s Sports Survey to find out what consumers believe are the most desired future features of live sports streaming and how consumers interact with live sports content today. Golfsupport.com discovered the number one future feature of live sports streaming, as voted by respondents ranging in age from 18-65 years-old, is to ‘gain insights into player stats and information’ – with 54% of 18-35-year-olds and 36% of 18-65-year-olds agreeing so. It’s reported 64% of people aged 50 and above opt to watch live sport online, showing the older generation is adapting to alternative ways of consuming live sport. However, Golf Support noted less than a quarter (24%) will consume non-live content online. This suggests the older generation watch live sport online in the same way they do on traditional telly. They tune in to enjoy a specific match and watch the entire broadcast, then, they switch off. For the younger generation, it’s a different story. Although more than 80% of those aged 35 and below opt to watch live sport online, an even greater proportion claim to consume non-live content online. This reveals the younger generation doesn’t watch live sport online with the same dedication as those aged 35 plus. Their viewing experience is more distracted. They will tune in for shorter chunks of time, to consume the highlights; the most premium, socially engaging and must-see content.